Pura Vida translated means pure life. It is the motto and mantra of pretty much every Costa Rican we’ve met. It can be used as hello, goodbye, or thank you – or even as the response to the question ‘how are you?’ with only the inflection used to indicate how the person is actually feeling. It’s a sentiment of freedom and contentment in life. We didn’t really notice how much the country has taken this mantra to heart though until we left. It is so chill in Costa Rica that as soon as we crossed the border into Panama we felt we were being bombarded by people. Not that Panamanians aren’t nice people, they just have a little less chill than Costa Ricans and we were a bit overwhelmed upon crossing the border. But I’m getting a head of myself. 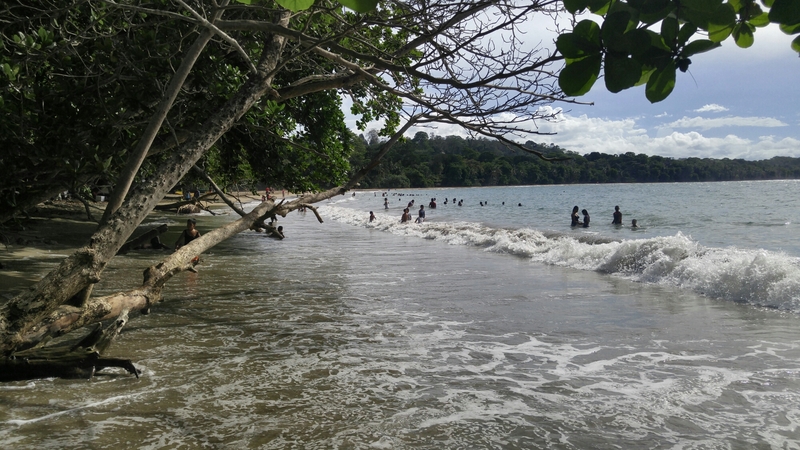 We spent our last few days in Costa Rica along the southern Caribbean side of the country in Cahuita and Puerto Viejo. In Cahuita we had our first day of rain. May is shoulder season for tourism as the dry season is just ending and the wet season beginning, but we like traveling in shoulder season since there are less people around and things are cheaper. 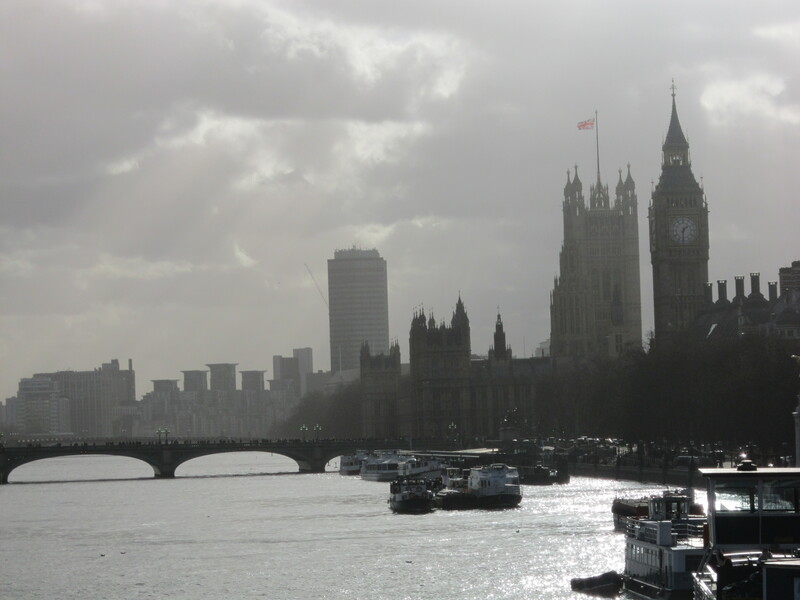 We expected some rain and couldn’t believe it held off as long as it did. Often it will only rain for an hour or so and then clear off again, but it stuck around for the whole day when we were in Cahuita. 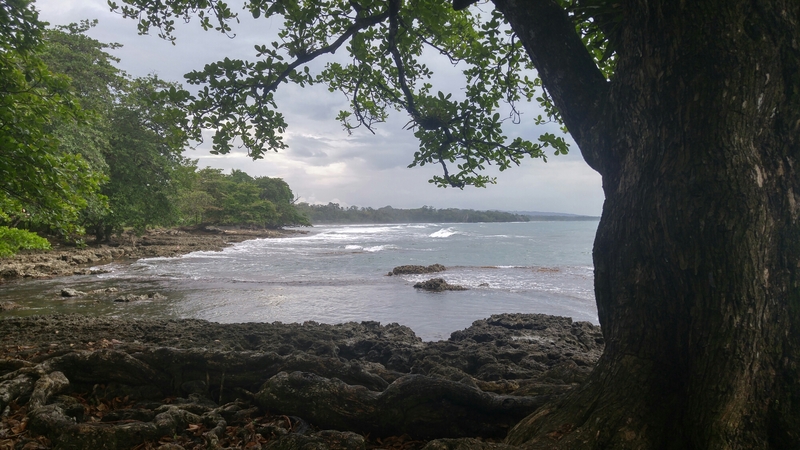 We’d planned to do an 8 km hike through Cahuita National Park, which is known for its wildlife, but it poured on us so we called it off about 2 kms in. It didn’t hinder our ability to see wildlife though and we still caught a glimpse of two white faced capuchin monkeys playing in the trees and got a close up look at a wild three-fingered sloth! – There are two types of sloths (which are quite different from each other): two-fingered and three-fingered sloths. – They’re more often known as ‘two-toed’ and ‘three-toed’ sloths, but the santuary refers to them as ‘fingered’ since both have three toes and are differentiated by the number of fingers. – Two-fingered sloths are nocturnal while three-fingered sloths are active during the day. Although both sleep for up to 19 hours a day! – Sloths spend most of their time in the trees and feel very unsafe on the ground. In fact, they can’t even walk on the ground and are forced to drag themselves along by their elbows. A grounded sloth is a vulnerable sloth. – Sloths cannot use the bathroom in the trees and go to the ground just once a week to use the bathroom for about 20 minutes. The average sloth will then release about a litre of pee and a kilo of poop! – They have 4 stomachs and eat only leaves. They move so slowly and sleep so much to conserve energy because of how little they eat. – The most common injury for sloths is getting eletrocuted from climbing on power lines and then falling. I could continue, but I’ll stop there. 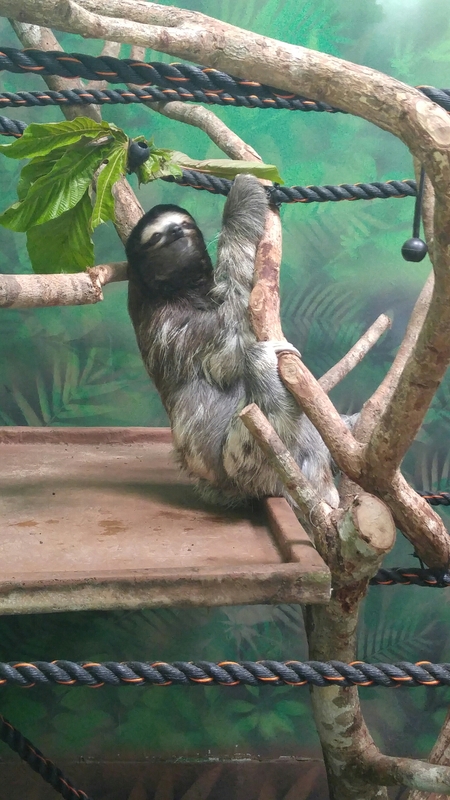 I’m sure you get the gist – sloths are awesome! 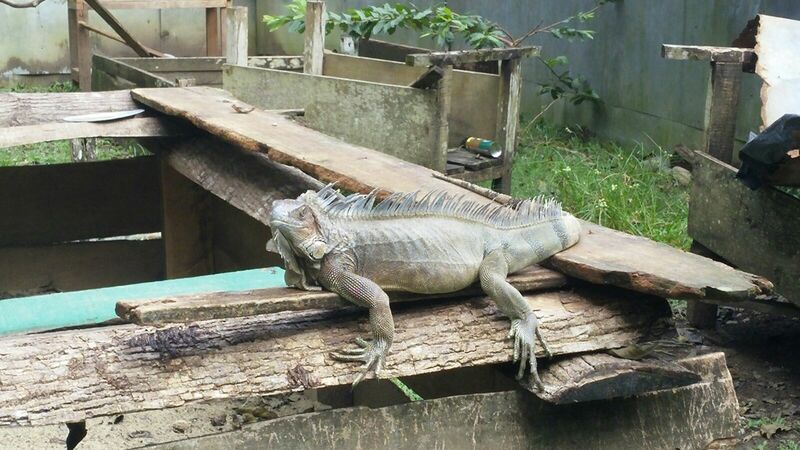 While in Cahuita we also made a short visit to an Iguana Farm and a Cacao House. Green Iguanas were endangered in Costa Rica, so the iguana farm was started as a conservation project by indigenous people. They breed iguanas and take care of them for 2 years. 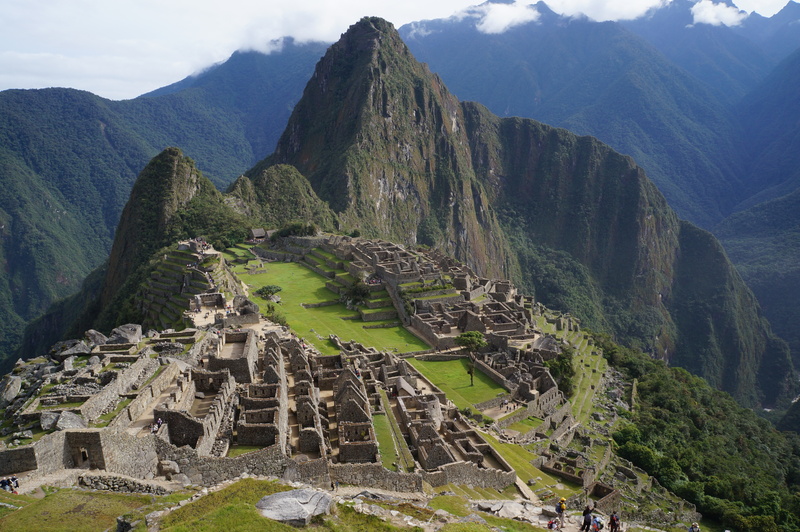 There are many similar projects around central America and as a result, populations have increased! The Cacao House is also run by the indigenous Bri-Bri people, to whom cacao is a very important part of their culture. They use all parts of the cacao bean in their daily life and we really enjoyed learned about it’s multi-uses. They also make some pure cacao chocolate for tourists, so we stocked up! It’s the first time I’ve ever tried a cacao bean. The bean is covered in a slimy white gel that looked pretty gross but actually tasted delicious, but the bean is very bitter. 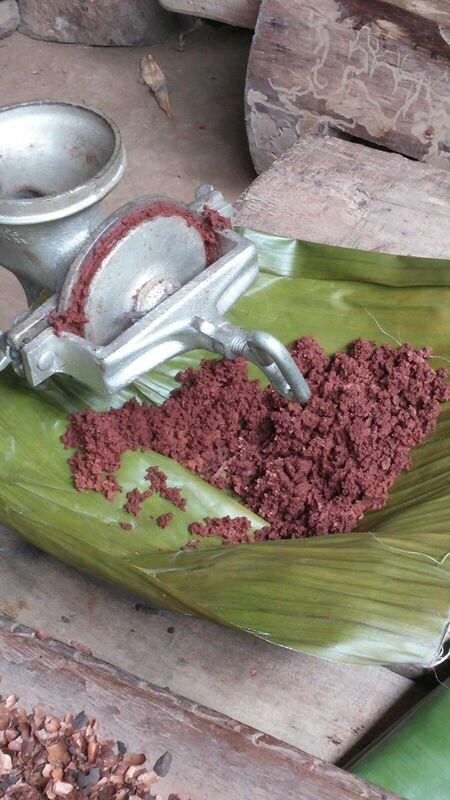 The beans are dried and roasted and then grinded into a paste. The paste is then boiled and the cacao oil is separated and used as a lotion or butter. It’s great for your skin so I bought a little pot of that as well! The great thing about the chocolate is that we don’t need to worry about it melting because it is pure cacao. On our last day in Costa Rica the sun came out again and we hit the beaches of Puerto Viejo. I loved Puerto Viejo. They have totally embraced the beach life and I felt so content and relaxed there. I really wish we’d spent less time in Cahuita and more time in Puerto Viejo (although this may have been influenced by weather), but there’s no way to know these things in advance. We rented some beach cruisers and biked along the coast. We spent the afternoon at beautiful Punta Uva Beach. Having just finished our beach hopping in Panama (that will have to be another post), I can conclude that Punta Uva was our favourite beach! It was miles of golden sand and clear water, so we split the afternoon between cooling off in the water and relaxing on the beach. We were sad to leave so much of Costa Rica unexplored, but pura vida, we’ll just have to come back again some day! Onwards to Panama! it seems this was the educational portion of your trip! Of course, I am very, very jealous of your sloth encounters. I didn’t realise that Green Iguanas were endangered in Costa Rica; surprising since they’re so common in the pet trade (and of course we had one as a member of our family for about a decade).